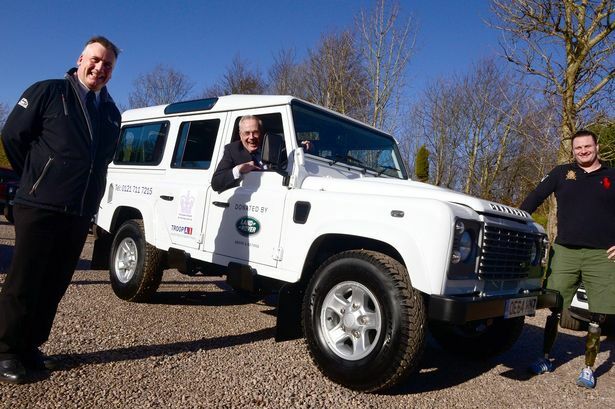 Jaguar Land Rover’s Solihull manufacturing plant has donated one of its iconic Defender 110 vehicles to Solihull based charity Troop Aid, which helps injured troops returning to the UK. The Defender, which is now in its final year of production, will help transport equipment and basic necessities for soldiers arriving at UK MOD hospital units, including the Queen Elizabeth in Birmingham. Last year, Troop Aid provided and distributed 1,300 ‘grab packs’ - which contain basic necessities for soldiers arriving to medical facilities straight from the field - to 14 countries worldwide. The charity also provides on-going support to the families of injured troops during their convalescence. Four years on from his traumatic experience Mr Smith has since learned to walk again and also took part in the Invictus Games, the international sporting event for wounded, injured and sick servicemen and women championed by Prince Harry. Competing as a cyclist, he was one of the 130 strong team who represented Britain. Jaguar Land Rover was a sponsor of the event and is also signed-up to the Armed Forces corporate covenant which supports the reintegration of the military forces into successful civilian careers. Over the past year, the manufacturer has recruited more than 100 ex-military personnel with over half of these based at Solihull. Peter Gray, manufacturing manager at the Solihull plant, said: “On behalf of the employees at the Solihull plant, we are hugely proud to donate this vehicle to such a worthy local cause. Jaguar Land Rover encourages employees to volunteer and support local community projects. The car-maker has also donated seven vehicles to local charity and community initiatives over the last year, representing £200,000 in donations.